Trojan Records has been an intrinsic part of Jamaican music and culture since it was launched in the summer of 1968. And as Jamaica marks its 50th year of the independence on 6th August 2012, it is natural that this famous label is closely linked with the celebrations. 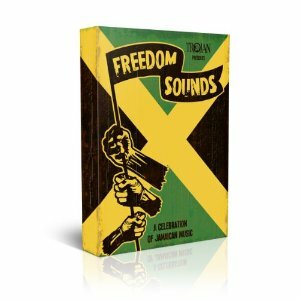 Trojan Presents ‘Freedom Sounds’ is a 5CD box set that honors the most important names in Jamaican music in the last five decades. Running across 5CDs this essential box set celebrates the leading performers (Bob Marley & The Wailers, Jimmy Cliff, Dennis Brown, Desmond Dekker, Toots & The Maytals, Gregory Isaacs, Augustus Pablo) producers (Lee 'Scratch' Perry, Duke Reid, Leslie Kong, King Tubby, King Jammy) and studios (Black Ark, Treasure Isle, Studio One, Channel One, Federal, Harry J, Randy's, Dynamic Sounds) that, over the past half-century, have shaped Jamaica’s national sound. Almost half the tracks are new to CD and tracks issued outside Jamaica for the first time include 'Fa Fa Fa Fa' (Toots & The Maytals), 'Brothers' (The Heptones), 'It's In The Plan' (the Planners), 'People Get Ready' (The Carib Beats), 'A Taste Of Reggae' (Ska Campbell), plus a previously unissued version of the Pioneer's hit single, 'Let Your Yeah Be Yeah'. The accompanying 52-page booklet was written by Record Collector Editor, Ian McCann and features detailed commentary on the history of Jamaica and its musical heritage. The set also contains a selection of celebratory A5 cards depicting various aspects of the Jamaican music industry over the past 50 years: labels, LP sleeves and artists. There's also a Jamaica 50 Trojan sticker plus rare photos. Fans purchasing the box set will also receive an additional free download album, when they register on the Trojan Appreciation Society website.